Superstars Jackie Chan, John Cusack, Adrien Brody, Choi Siwon, Lin Peng and Wang Ruo Xin will be in Singapore from 9th to 11th February 2015 to promote the upcoming Chinese New Year action blockbuster, Dragon Blade. The stars are set to embark on a flurry of promotional activities in Singapore, their 1st stop in Asia. Dragon Blade is a legendary blockbuster directed by the highly-acclaimed director, Daniel Lee (“14 Blades”, “Three Kingdoms”), starring Jackie Chan who also works as executive producer, John Cusack, Adrien Brody and Choi Siwon. This epic blockbuster is filmed at a budget of US$65 million, a record-breaking figure for a Chinese film. Dragon Blade is a story set in 48BC during the Han Dynasty. Huo An (played by Jackie Chan), the Commander of the Protection Squad of the Western Regions, who protects China’s border and secures peace among warring tribes on the Silk Road. When a convoy of gold bearing a foreign insignia is discovered inside China, he is accused of treason and sent to the border as a slave laborer. With only a small group of his most loyal soldiers, including his right hand man, Yin Po (played by Choi Siwon), he must fight to survive in the prison camp. When a small army of Roman soldiers led by General Lucius (played by John Cusack) appears at the border gate, they outmatch the Chinese border guards. However when Huo An enters the battle, he single-handedly turns it around and earns the respect of Lucius. Among the Romans is a blind boy called Publius, the youngest son of Rome’s Consul Crassus. Crassus was assassinated by his ambitious eldest son, Tiberius (played by Adrien Brody), who is leading 100,000 soldiers towards the border gate, employing subterfuge to kidnap Lucius. This leads to a thrilling piece of history that has never before been told. 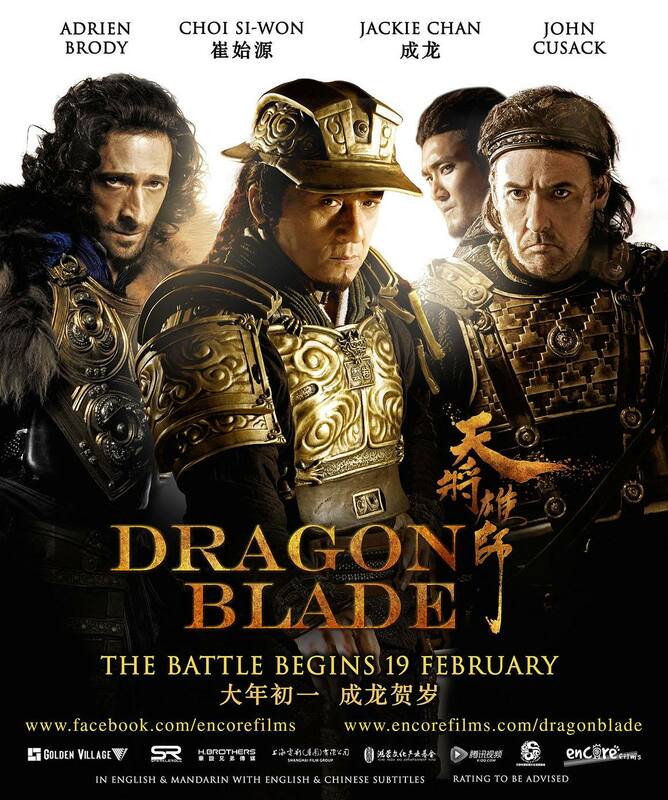 Dragon Blade is co-distributed by Encore Films and Golden Village Pictures in Singapore. It is scheduled for release on Chinese New Year’s Day, 19th February 2015 in Singapore.